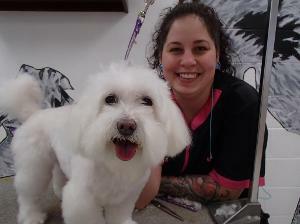 Our professional groomers and certified bathers will work with all sizes and breeds of dogs, from lovable "Mutts" to "Blue Ribbon Show Dogs". 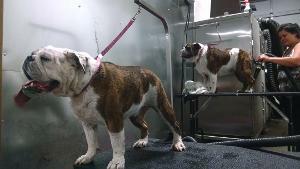 Temperature controlled, gentle shower water sprayers and deep cleaning shampoo machines are a few ways we can pamper your pup. Our enormous 58" stainless steel tub has a textured ramp and walk-through door for ease of access regardless of your pets size or age. We offer a Shed-Less treatment for those heavy shedders. Not only do we use skilled techniques to properly brush out, but we also use products designed to reduce shedding between baths and grooms. We want your pup to 'Shed-Less'! All grooms and baths feature honey shampoo, tearless face wash, hand toweling and fluff drying, nail trim, ear cleaning, perfume, and a colorful bandana. Medicated, Skunk, Flea treatments are also available. Prices will vary depending on the breed, size and condition of the coat.